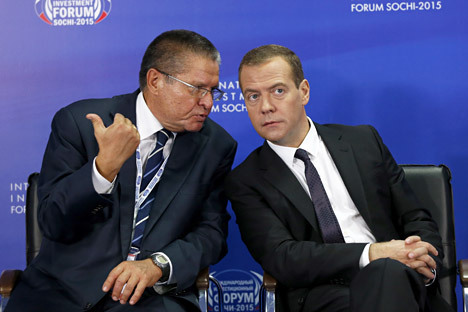 Russian Prime Minister Dmitry Medvedev (right) and Minister of Economic Development Alexei Ulyukayev attend the round table 'Investment Climate At The Local Level. Keys To Success' at the International Investment Forum Sochi 2015. Russian Prime Minister Dmitry Medvedev said oil and gas revenues provided less than half the federal Russian budget for the first time, and said the country needed to cut dependence on oil revenues. Speaking at a forum in Sochi, Medvedev said this could be achieved through reforms, stimulating domestic manufacturing and cutting spending. Oil and gas revenues have provided less than half the Russian federal budget for the first time, Russia’s PM Dmitry Medvedev said, speaking at the Sochi International Economic Forum. Fall in global oil prices and Russia's flexible monetary policies are the reason this has happened, but the trend needs to continue even when oil prices rebound to high levels, he said. According to Medvedev, oil and gas revenues should not be the primary revenue source to fill the federal coffers to replenish the budget, and windfall profits from (possible high) oil sales should be moved to sovereign wealth funds. Many changes have occurred in the global and the Russian economy over the past year, the PM noted. "Business must not divide countries but, on the contrary, unite them and such contacts connect governments better than any policy," he said. Growth rates in the world remain quite low, even in the U.S., they are lower than experts expected, while the EU is showing zero growth. Medvedev added that instability in the global economy and politics has had most impact on the situation of developing countries. "The Russian economy is a hostage to and beneficiary of globalization. Russia cannot ignore global trends as it concentrates on its own development," Medvedev said. "For the last year and a half, the Russian economy has had to face unprecedented sanctions from the West and, in many cases, the sphere of technology has been completely closed to the country," he added. The Russian government was aware of what consequences the sanctions could have, but decided to go ahead and made a conscious political decision, to secure Crimea, after which the European Union and the United States imposed sanctions. Medvedev told the forum that Russia has begun to involve experts to work on a development strategy for the country until 2030. This strategy will have four priorities: investments, import substitution, improved quality of government administration, and budget policy. According to Medvedev, the stimulation of investment activity will be one of the main directions in the strategy: "The objective is to remove the barriers that impede (private) money from entering the market," he said. In the course of the last year several institutes for attracting private enterprises to the economy have been created in Russia. One of these is the Industrial Development Foundation, which was established to help enterprises in their early stages. The government has also made financial instruments accessible for a broader circle of investors. According to Medvedev, so-called “import substitution” – replacing imported goods with domestically produced ones – is the most important element for structural reforms and competitive enterprises can make the economy more balanced. "Returning Russian goods to the market is the first step and the ultimate objective is the creation of competitive production," he said. In several sectors, for example, the food and pharmaceutical industries, products can be quickly brought onto the market, while in others, such as machinery, the investment cycle is longer. Medvedev underlined that all countries that have taken a giant leap in development made governmental reforms. Furthermore, in the near future, the reduction of revenues and the fall in oil prices will make budget policy even harder. "The 2016 budget is being prepared according to this principle and the only protected articles will be Russia's international obligations, security, agriculture and social policy," he said, adding that government spending would be reduced for the other fields.